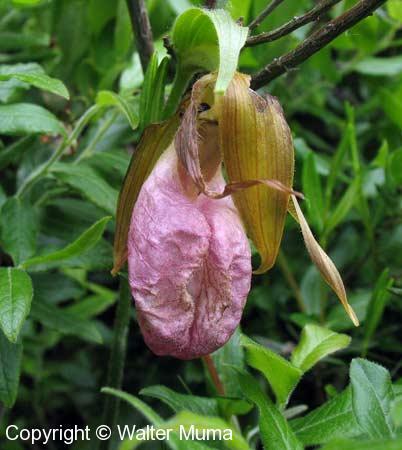 Distinctive features: Classic Lady Slipper flower shape; pink. 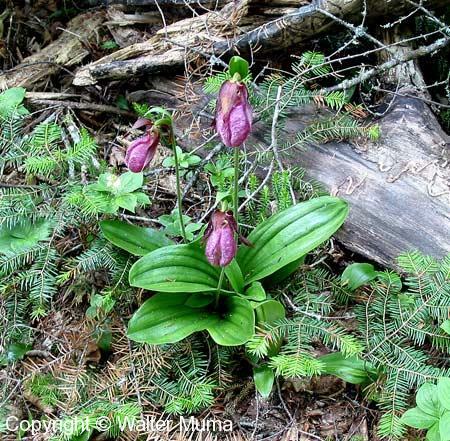  Showy Lady's Slipper (Cypripedium reginae) - larger; pouch light pink or almost white. Flowers: Summer; Red/Pink; Irregular flowers; Pink, hollow pouch-shaped, deep cleft in center. Late spring - summer. Leaves: Two oval basal leaves, standing up. Habitat: Wet Areas; Dry or moist woods, usually under Oak or Pine trees. Notes: When you find this orchid, do not disturb it. 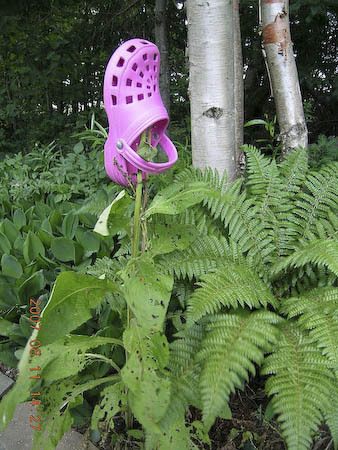 DO NOT transplant it - it will not survive. 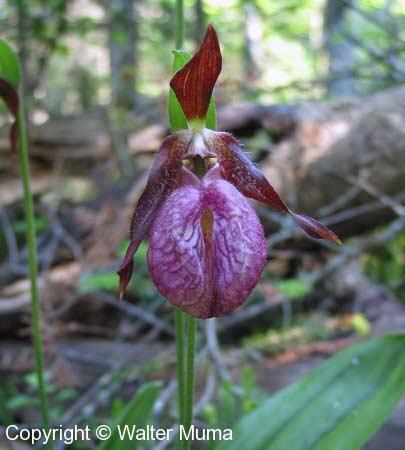 This orchid is disappearing in the wild partly due to misguided attempts to transplant it, also due to habitat loss and intrusion by people who want to view these beautiful flowers. Photographs: 761 photographs available, of which 5 are featured on this page. SCROLL DOWN FOR PHOTOGRAPHS. A beautiful flower! This one was on the north shore of Lake Superior in mid-July. A small group of plants in the same locale. The flower in this specimen is just starting to wither, so the colour has faded a little bit. This was in southern Ontario in mid-June. Side view of the same flower. Photograph by Henry Mann Another type of Pink Lady's Slipper! �:).